To commemorate its 125th anniversary, the National Society of The Colonial Dames of America in The State of Connecticut is proud to unveil its beautiful history-inspired scarf. The design centers on the crucial meeting of General George Washington and French General Jean-Baptiste Donatien de Vimeur, comte de Rochambeau, on May 22, 1781 at the Joseph Webb family home in Wethersfield, Ct. This pivotal meeting, known as the Wethersfield Conference, led to the joint French and American Victory over the British army five months later at Yorktown, VA. The British surrendered on October 19, 1781, ending the Revolutionary War. This transitional period of the American Revolution is symbolized on the scarf with researched historical elements. Created by internationally acclaimed designer, Marisol de Luna, the 36 inch silk scarf uses the elegant Pantone colors of the NSCDA as the background. In the striking center of the scarf is the date of the Wethersfield Conference, May 19-23, 1781, encased by gold roping. The encasement is balanced on one side by the furled flag of the French Bourbon king, Louis XVI, and on the other side by the furled American flag with thirteen stars representing the thirteen colonies. At the top of the encasement is the noble American eagle, our national symbol, chosen in 1782 for its majesty, strength, and long life. 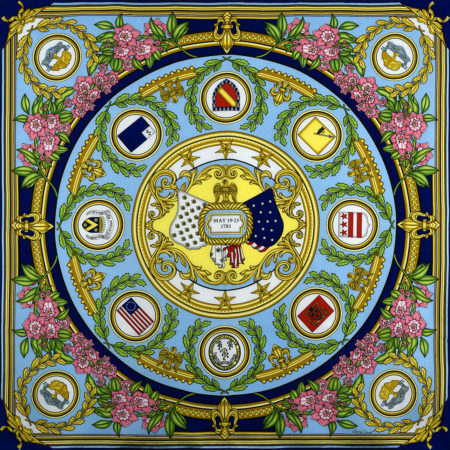 The inner circle portrays a combination of seven flags, coats of arms and emblems of those who laid the foundation of our fledgling country. At the bottom of the circle is the Colonial Seal of Connecticut which was used before, during, and after the American Revolution until 1784: Surrounding these eight emblems are leaves of white oak, symbolizing the legendary Charter Oak of Hartford, Ct. 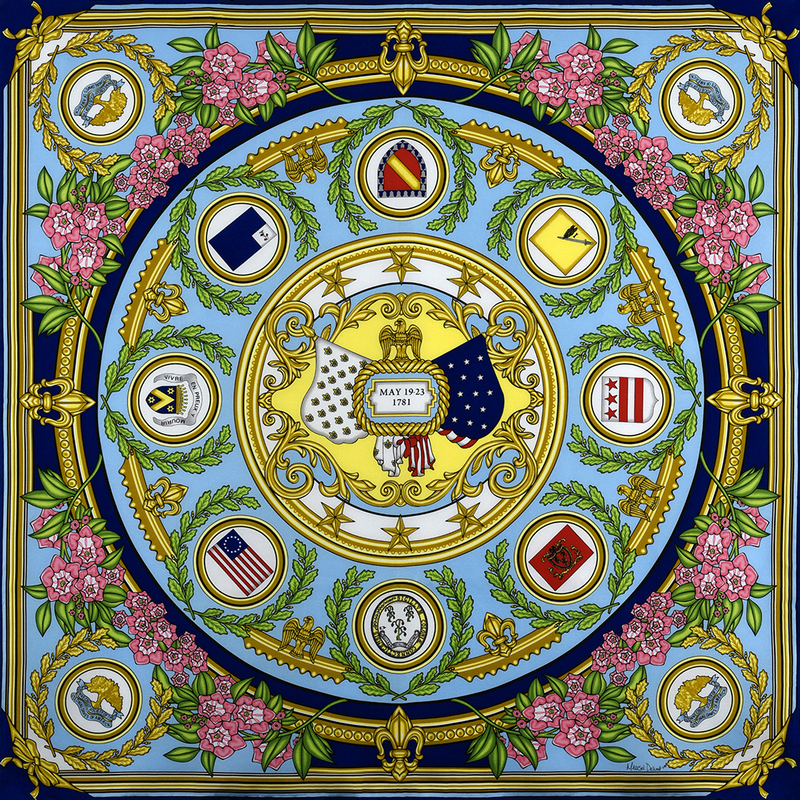 Between the emblems are alternating French fleurs de lis and American eagles symbolizing the friendship and alliance between the two countries. The outer circle is composed of Connecticut’s state flower, pink mountain laurel, interwoven with large fleurs de lis on four sides. Each corner displays the Charter Oak pin of the Connecticut Society. We are honored to play an integral part in preserving our nation’s heritage and hope that you will wear this scarf with great pride.